All rooms have radio alarm clock, well equipped hospitality tray, mini fridge, hairdryer and toiletries. With entertainment consisting of TV/DVD units, with some having CD players. All rooms have an outlook over the garden grounds with spectacular mountain views beyond. A large bright room with 1 king size bed and 1 single bed and en suite bathroom. Overlooking the garden with views to the hills, Loch Meiklie and towards Glen Affric. A bright twin room with loch views and en suite shower room. A compact and comfortable double room with luxury en-suite bathroom and large bath with shower over, loch views. 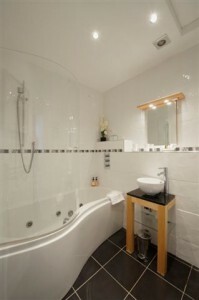 A compact and comfortable double room with luxury en-suite bathroom with large bath and shower over, loch views. A spacious en-suite superior double room with king size bed. It has a flame effect fitted fire giving a warm and cosy atmosphere and splendid views of the loch. Fold out beds available for extra guests.